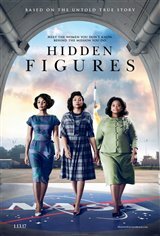 The inspirational true story of the first female African-American mathematician, Katherine Johnson (Taraji P. Henson), and her two colleagues, Dorothy Vaughan (Octavia Spencer) and Mary Jackson (Janelle Monáe), whose groundbreaking calculations helped NASA catch up in the "Space Race" with the Soviet Union and allowed John Glenn (Glen Powell) to become the first American astronaut to successfully make a complete orbit of the Earth. In addition to helping launch John into orbit, the brilliant women crossed gender and race lines, defied expectations and battled stereotypes. In the process, they inspired generations of people to aim high and dream big.